Handling waste is not everyone’s cup of tea… but at Patriot Sanitation Management we do it with pride, commitment and excellence like no one else. Got commercial waste? We’ve got you covered! 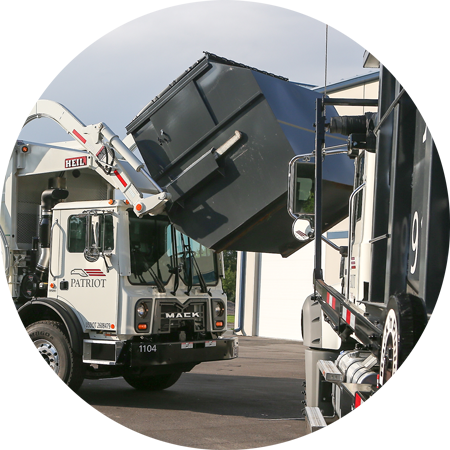 Patriot would welcome the opportunity to serve your company’s waste management needs. We offer commercial front load service, as well as construction roll-off dumpsters. We are also flexible in accommodating your pick-up schedule—whether it’s daily, weekly or monthly… or an on-call basis. Note: Do not overfill dumpsters as they must be level across the top. Do not exceed the maximum load weight limit. Available in both flat-top and slant-top styles, front-load containers from Patriot Sanitation can ensure you have the space necessary to accommodate all your waste. At Patriot Sanitation Management, we have service standards that we strive to meet for all our commercial customers. Front load containers will be delivered clean and fresh on the promised delivery date. With our relentless pursuit to please the customers, we are simply your best choice. We never lose sight of the fact that the customer is the single most important factor of our success. The larger national companies we compete with provide a one-size-fits-all model and simply lose sight of the overall customer relationship. They tend to turn their attention to increased margins share price, ultimately locking customers into subpar services that fail to accommodate the customer's true needs. We answer to the customer and go above and beyond to meet your needs. You are never locked in and we understand this means we have to always serve you and your needs. Our goal is to please our customers, not shareholders! Find out how much money you can save on your Commercial Disposal Services.